What is your single best piece of advice for handling a concussion? It may seem like a basic question, but I’m finding there is still a lack of understanding and misunderstandings about the mild traumatic brain injury. So I asked athletic trainers dealing with concussion risk virtually every day. Athletic trainers also maintain continuing education regarding concussions, and comply to some of the highest standards of care established by the National Athletic Trainers Association (NATA) and the American College of Sports Medicine (ACSM), among others. Adding my own single best piece of advice, concussions do not discriminate. Concussions occur at epidemic levels, so everyone must have a basic level of knowledge of the injury. It’s not OK for onlookers to see a massive clash on the field, notice unusual reactions by the athlete and do nothing. The sports culture needs to shift from “it’s just a ding” to “it means everything” to take concussions seriously. Don’t move an unconscious person. Call 9-1-1 if the person does not wake up in 30 seconds. 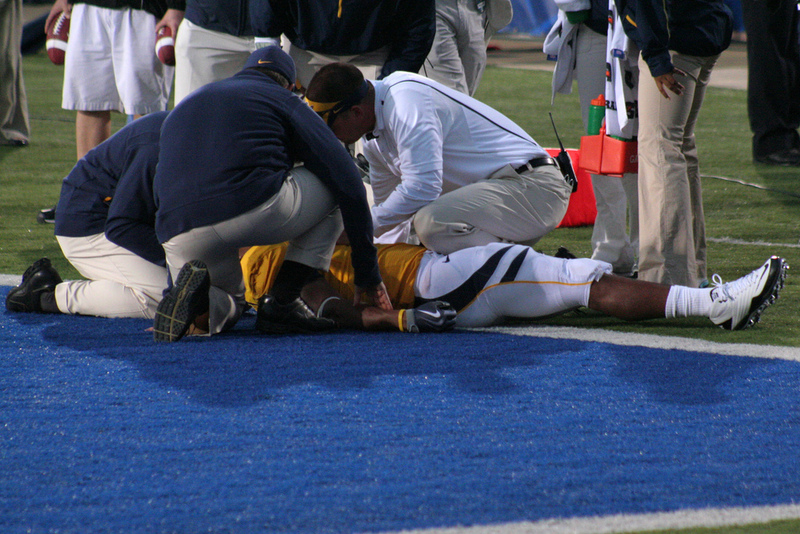 An unconscious athlete should always be assumed to have a cervical spinal injury. Moving them before proper stabilization of the cervical spine can risk quadriplegia or even death. This includes removing the helmet. When awake, ask the person if they feel injured, and can get to their feet. Don’t decide too early. Although evaluations should begin immediately, it’s important to note that many concussion symptoms are not experienced for 24 hours. In the meantime, any trouble with responding to questions, standing, walking qualify as effects of possible concussion. Every team should have a “sideline assessment” using a smartphone that can help provide medical personnel other necessary information. “When in doubt, sit them out.” Error on the side of caution because there’s really no need to return to play. Rest. The best thing to do to heal from a concussion is rest. However, to expedite recovery., I prefer the term “relative rest,” which includes gradual reintroduction of cognitive and physical activities. Sleep is very good for the brain, so monitor that closely. Comply with state laws. Today, every state requires that clearance to return to play be given by a qualified medical professional. It’s always helpful to provide your doctor all the facts from your evaluation from the “crash” seen on the field. Details about the way the injury occurred, the person’s responses, and resulting actions all play a factor in the final decision. For more information on the XLNTbrain Complete Concussion Management program, register for one of our free information sessions.